1) HW251 SupraPlus – When the world’s most popular headset was refreshed, nothing was sacrificed. With all the great features you’ve com to expect from Plantronics’ flagship headset, after 50 years, the HW251 continues to set the standard in quality, sound, and styling. 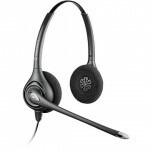 2) HW251N SupraPlus – Our most popular Plantronics corded headset. From the busy call center to the small one-man office, the HW251N continues to be the gold standard among headsets. Style, performance, and durability make this headset #1 among today’s professionals. 3) HW261N SupraPlus – For better hearing in a noisy environment, the HW261N is the choice for you. It not only provides the patented noise-canceling microphone from Plantronics, but with two speakers to cover your ears, you’ll always be able to hear your callers loud and clear. 4) H141N DuoSet – A quality entry-level commercial-grade headset, the H141N Duoset is just right for the cost conscious business person. It offers two wearing styles, and the noise-canceling microphone drowns out unwanted noise around you. You don’t need to sacrifice quality for price. 5) HW291N EncorePro – Don’t think that the newly reworked version of the Encore brand can’t stand up to the rigors of a busy office. Carrying on in the fine tradition of its predecessors, the HW291N offers the highest quality discerning users have come to expect in a high-end headset, and it’s just right for today’s new phones. I was wondering if you tried any other heeadst mics. I’m looking for something to use when I’m away from my good setup at home and can’t carry around all my gear. Are these good enough? Did you post any recordings you’d made with them. I’m most interested in the recording quality for speech! The Plantronics Blackwire C420 was used for most of our video recording.